Palermo lost 1-3 to Cagliari at home last week, their fourth loss in a row. For this most recent loss, manager Diego Lopez lined up Fulignati; Gonzalez, Goldaniga, Vitiello, Chochev, Henrique, Gazzi, Pezzella, Rispoli, Nestoroski, and Trajkovski. Lopez will be missing Silva and Rjkovic to injury, as well as Gazzi to suspension. However, he got some good news in that Diamanti appealed his two match suspension and it was overturned, so he will be available to face Milan. Montella still has injury worries, even if they are getting less in number every day. 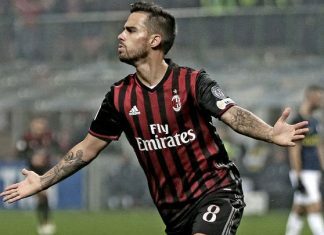 Suso returned to training this week. But on the flip side, Montolivo is also back in training. One of these things is not like the other. Bonaventura, Abate, and Bertolacci are out. But none of these should be excuses against the 19th place team. However, if you saw last week’s match, you’ll know that there’s no excuse anyway. If the table advantage isn’t enough, being the home side for this one should give us an advantage. But Palermo have one advantage: Milan. And we are our own worst enemy. People off the pitch will be focused on the 3,429th closing date of this Friday, wondering if it will happen at all and what will happen. And if not that, the Derby on Saturday. But if Montella has anything left in his bag of tricks, perhaps he’ll find enough mentality for the guys to play a proper match and defeat the team with the new American owner. Because if he can’t, “one of these things is not like the other” could be very, very bad for us.